RFJ02830A-ADW-DNN is a 2.83 inch portrait mode Transflective TFT-LCD display module, made of resolution 240x320 pixels. RFJ02830A module built in with HX8367-A driver IC, it supports MCU/SPI/RGB interface; View Direction 3 o’clock, Gray Scale Inversion Direction 9 o’clock, Aspect Ratio 3:4, brightness 500 nits (typical value), Glare surface panel. This TFT module can be operating at temperatures from -20℃ to +70℃; its storage temperatures range from -30℃ to +80℃. RFJ02830A is a Transflective TFT-LCD display; it is characterized by very good readability in bright environments and direct sunlight. Transflective TFT display featured a transparent reflector in front of the backlight. The incoming light is reflected and used to illuminate the TFT display. Therefore, the readability of the content in very bright light is perfect even without any backlight. 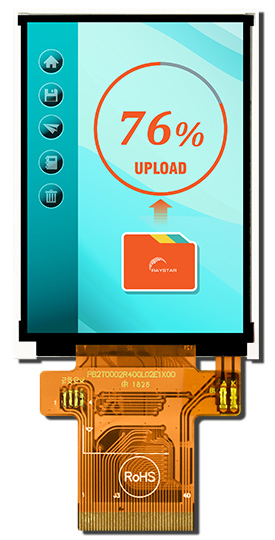 Customers using a transflective TFT module can save power by reducing or turning off the display’s backlight during bright environments. 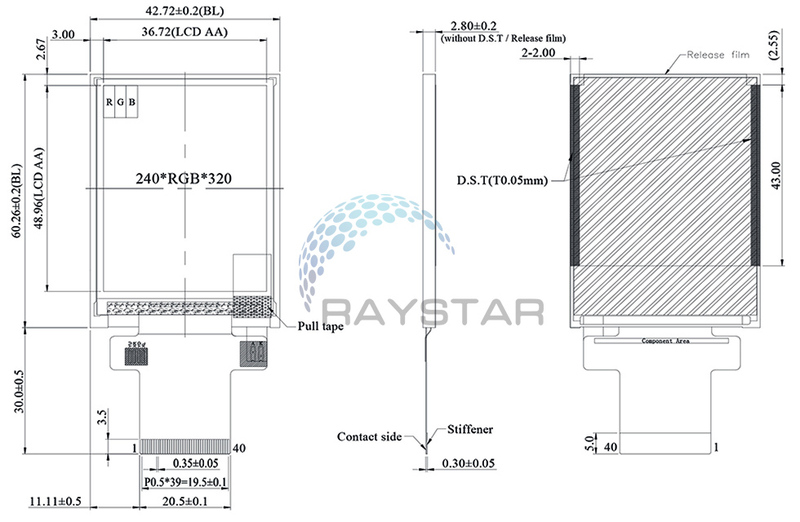 RFJ240L-AYW-DNN is a 2.4 inch IPS TFT-LCD display module; made of resolution 240 x 320 pixels. RFJ240L module built in with ILI9341V controller IC, it supports MCU8080 and SPI interface, it featured with IPS panel which is having the advantages of wider viewing angle of Left:80 / Right:80 / Up:80 / Down:80 degree (typical), contrast ratio 800 (typical value), brightness 500 nits (typical value), Glare surface panel. 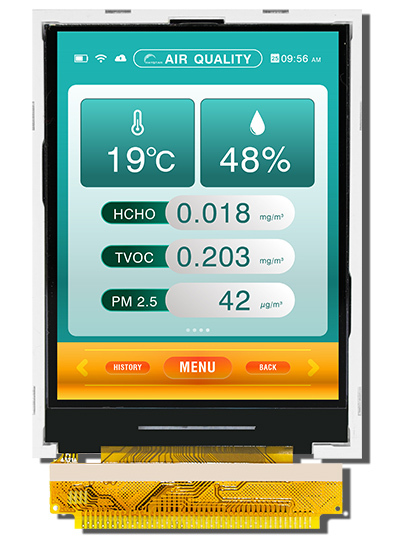 WF24L is having Resistive Touch Panel (RTP) available for option. 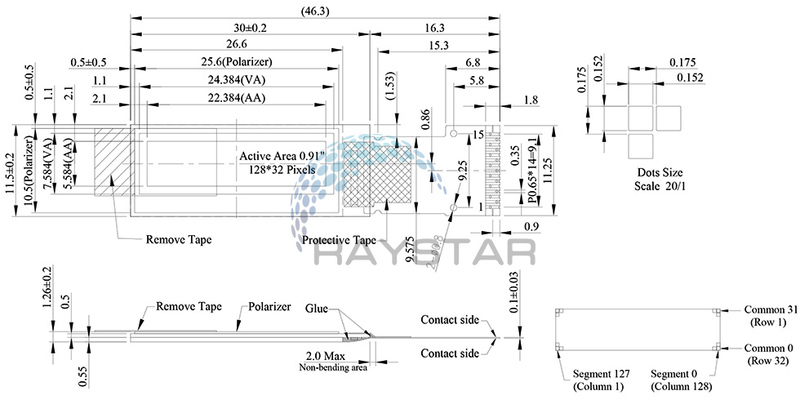 Raystar OLED REH012864H is made of 128x64 pixels, diagonal size 2.42 inch. This graphic display is built-in SSD1309ZC controller IC and it communicates via 6800/8080 8-bit parallel, I2C and 4-wire serial interface. REH012864H is having the same OLED panel as existing REX012864G and featured with a bezel (frame) on module. REH012864H is using a low resistance OLED Panel, and the FPC pin assignment has been defined as the same as REH012864Q (30 pins). REH012864H is a COG structure OLED display; this OLED module is lightweight, low power and very thin, it is suitable for wall / meter devices, home applications, intelligent technology devices, energy systems, communication systems, medical instrument, etc. REH012864H OLED module can be operating at temperatures from -40℃ to +80℃; its storage temperatures range from -40℃ to +85℃. The 0.91 inch is one of the most popular sizes of COG OLED for wearable displays. 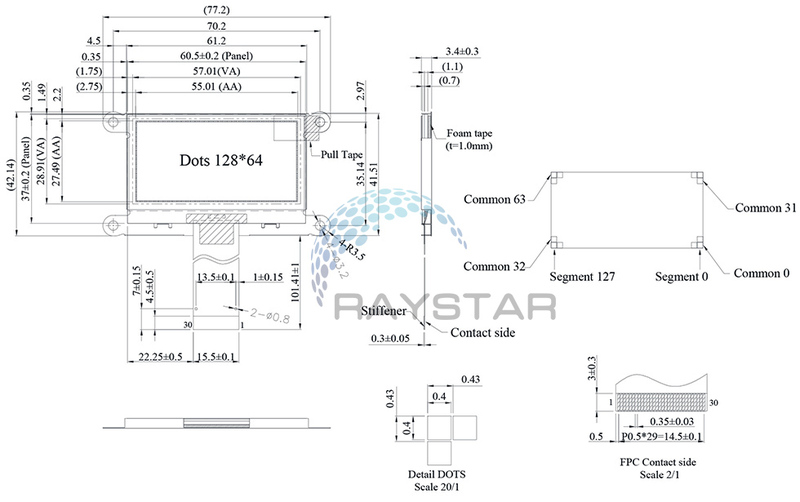 Raystar released a thinner version of REX012832D model which is made of 128x32 pixels. 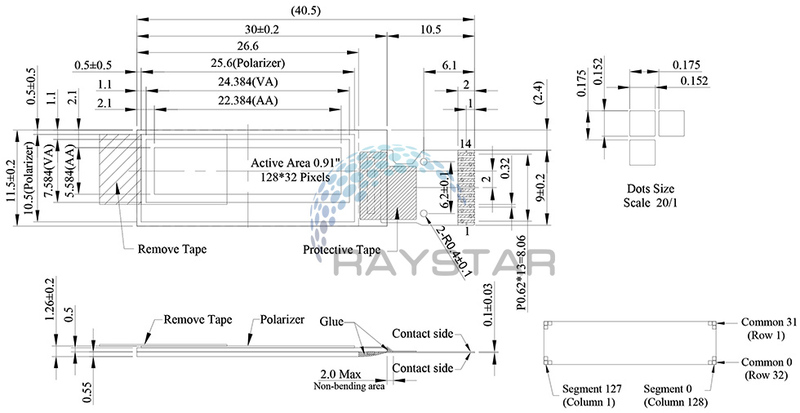 The outline dimension, active area, viewing area and electronic characteristics of the thinner version and the original REX012832D are the same, the main difference is the module thickness, the new one is 1.26 mm on thickness as to the original one is 1.45 mm. The new version thin 0.91" REX012832D is also built-in SSD1306BZ driver IC; it communicates via 4-wire serial SPI interface only. 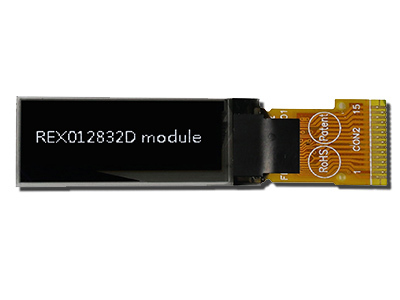 REX012832D OLED module can be operating at temperatures from -40℃ to +80℃; its storage temperatures range from -40℃ to +85℃. Adopting thinner OLED panel is a market trend; please adopt the thinner one for new design projects. If customers would like to use the new thinner one to replace the existing one, please contact Raystar sales reps for more details. 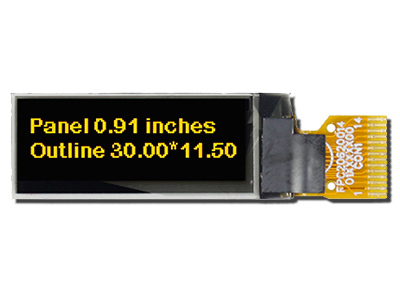 REX012832F is a popular small OLED display which is made of 128x32 pixels, diagonal size 0.91 inch. We released a thinner version of REX012832F which having the same outline dimension, active area, viewing area and electronic characteristics as the original one; the main difference between the thinner version and the original REX012832F is the module thickness, the thinner one is 1.26 mm as to the original one is 1.45 mm. REX012832F module is built in with SSD1306BZ controller IC; it supports I2C interface and having 14 pins FPC pinout. REX012832F is a COG structure OLED display, its controller is built-in voltage generation only need a single 3V power supply. 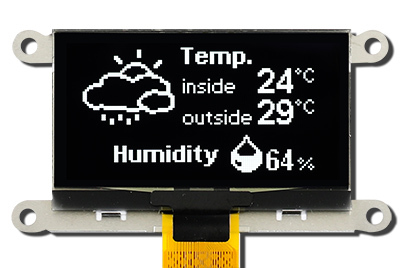 This OLED I2C Display is lightweight, low power and small, this COG module is suitable for wall / meter devices, home applications, Cloud/IoT system, handheld instruments, intelligent technology devices, energy systems, automotive, communication systems, medical instrument, wearable device, etc. REX012832F OLED module can be operating at temperatures from -40℃ to +80℃; its storage temperatures range from -40℃ to +85℃.